Grooved construction for added strength. Used for mounting of pipes to the walls (vertical/horizontal). 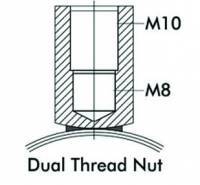 Hanging type is M8/M10 combi nut. High Quality Rubber lining for suppression of sound & vibrations. Lock bolts with combi cross recessed head. M6 Side Screws with PE captive disc.